During her stint as the nation’s First Lady, Michelle Obama introduced the Let’s Move initiative. She said that she often hosted boot camps for her close friends during weekends during her time in the White House. She continued that routine even when she is no longer the First Lady. Planking targets your core muscles, and at the same time improves your endurance, balance, and strength. When done the right way, the body is straight and rigid, just like a wooden plank. The best thing about planking is that it doesn’t require special equipment. Lunges are great for your glutes, hamstrings, quads, and core muscles. It helps you develop your endurance and lower-body strength. When you do lunges, you need to keep your body straight, and your chin up while staring to the front at all times. Step with a leg and then lower your body until both your knees form a right angle. The front knee must be right above the ankle, and the other knee must be above the ground. The crunch is one of the most basic abdominal exercises. It is important that you pay close attention to your form to prevent neck or lower back problems. Jumping rope is a good way to burn calories. Doing this exercise for ten minutes can help you burn as many calories as running at a speed of eight minutes per mile. 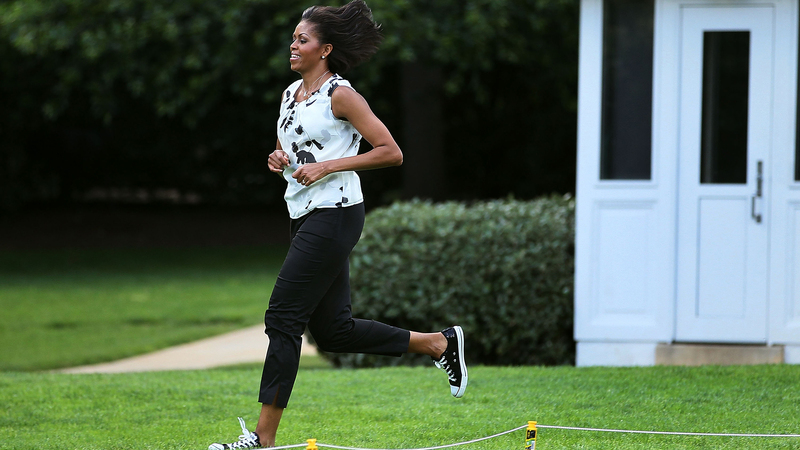 Michelle Obama does these four exercises with her friends. Your group will have fun doing the exercises as your group works towards a common fitness goal.